When this type of phallic-looking clam is around, discarded timber turns into a tasty treat. 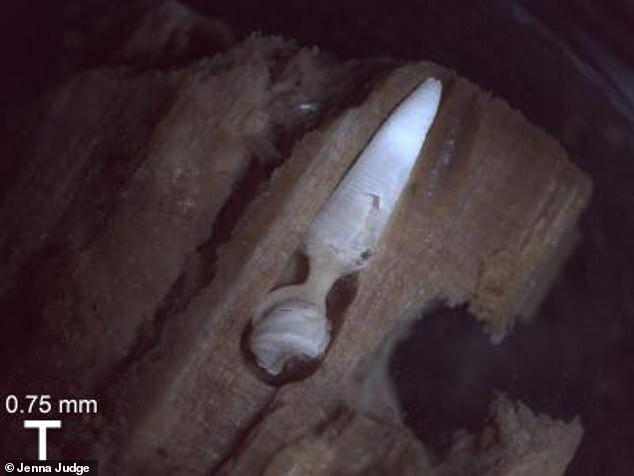 Researchers recently discovered one new species and several new genus groups of wood-boring clams, which feast on wood debris in the ocean. The discovery of the new specimens expands the number of wood-boring clams known to humans to twice the size previously thought. This class of clams uses its oddly shaped body to bore into wood debris found in the ocean. Once inside its meal/home it begins to use its tube-like ‘siphon’ to scrape the wood and consume the resulting sawdust. While the clams are extremely tiny, they often congregate in large numbers. As a result, they may be instrumental in helping rid the ocean of wood debris from storms and more. ‘There’s not just one tree-cleaner-upper in the ocean, they’re really diverse,’ says Janet Voight, Associate Curator of Invertebrate Zoology at the Field Museum and the study’s lead author. 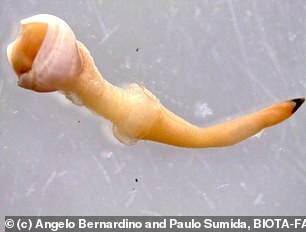 ‘Imagine living at the bottom of the ocean as a tiny swimming clam; you either have to find a sunken piece of wood or die. ‘You wouldn’t think there’d be that many kinds of clams doing this. 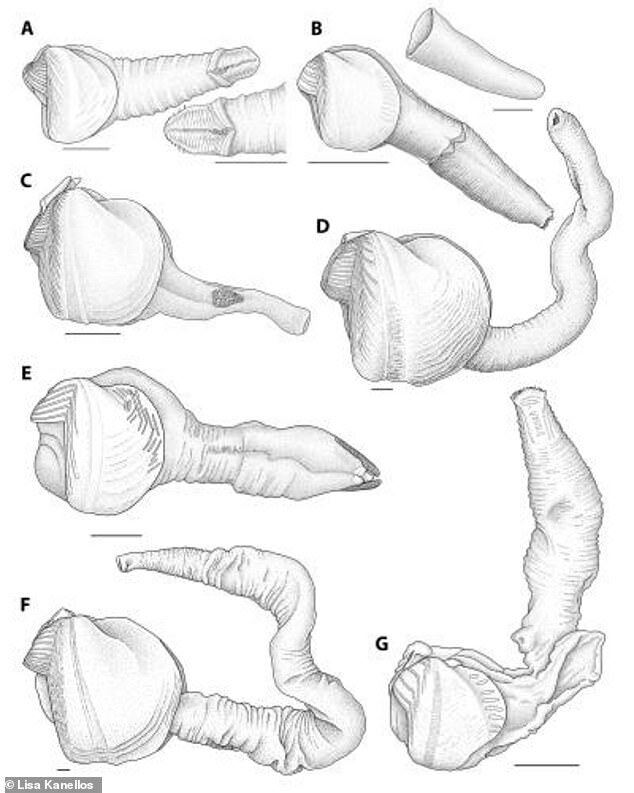 In addition to being somewhat comical in shape — a phallic tube-like organ called a ‘siphon’ protrudes from their shell — researchers note that the type of clam may also have a profound ecological impact. The clams, which bore into wood and use their bodies to scrape off sawdust and eat it, are among the only species on Earth known to eat wood and because of their unique diet, scientists say that the class of clams could be instrumental in regulating the amount of wood in the ocean. ‘We have no idea how much wood is at the bottom of the ocean, but there’s probably a lot more than we think,’ said Voight in a statement. According to researchers, while the clams are tiny — some of their shells are about the size of a pea even for adults — they often settle in large numbers allowing them to quickly take care of wood debris. Voight says that since the clams are efficient and almost alone in eating wood that finds its way into the ocean they also play a crucial role in cycling carbon — turning trees in the ocean into waste that other animals in the ocean can get energy from. ‘It blows me away,’ she said in a statement.